Recently I needed a quick solution to deploy a Java EE 6 web application on a GlassFish instance automatically and subsequent to a successful build of the project on the integration server. It took only a few steps using Jenkins, Maven and the Cargo plugin and I’d like to share this quick solution with you here. Using default port 4848 for Admin. Using default port 7676 for JMS. Using default port 3700 for IIOP. 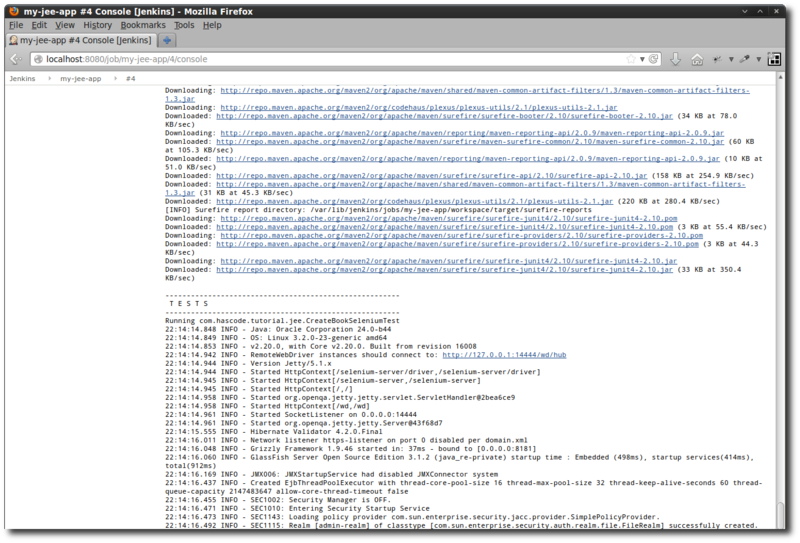 Using default port 8181 for HTTP_SSL. Using default port 3820 for IIOP_SSL. Using default port 3920 for IIOP_MUTUALAUTH. Using default port 8686 for JMX_ADMIN. Using default port 6666 for OSGI_SHELL. Using default port 9009 for JAVA_DEBUGGER. Domain mydomain admin port is 4848. Domain mydomain admin user is "admin". Database started on host 0.0.0.0, port 1527. Our web application runs on port 50447 because port 8080 is already in use on my machine because I’m running Jenkins and GlassFish on the same host for this tutorial. To continue this tutorial we need a Java EE 6 application and of course some tests to run for the project. For this purpose I am using the source from my tutorial “Arquillian Tutorial: Writing Java EE 6 Integration Tests and more..” here. The project contains a JEE web application and Arquillian based integration tests for the repository layer implemented using stateless session beans. We’re using the Cargo Plugin for Maven to deploy the application, configured for a dedicated target container: glassfish3x. Configuration for the deployment container and its credentials may be added to the plugin configuration but should be kept separate using placeholders or dedicated Maven profiles. Please note the additional dependency for deployment-client – this is neccesary to get a JSR-88 compatible deployment client. Now we’re ready on the project and we just need to add some configuration to the integration server.. 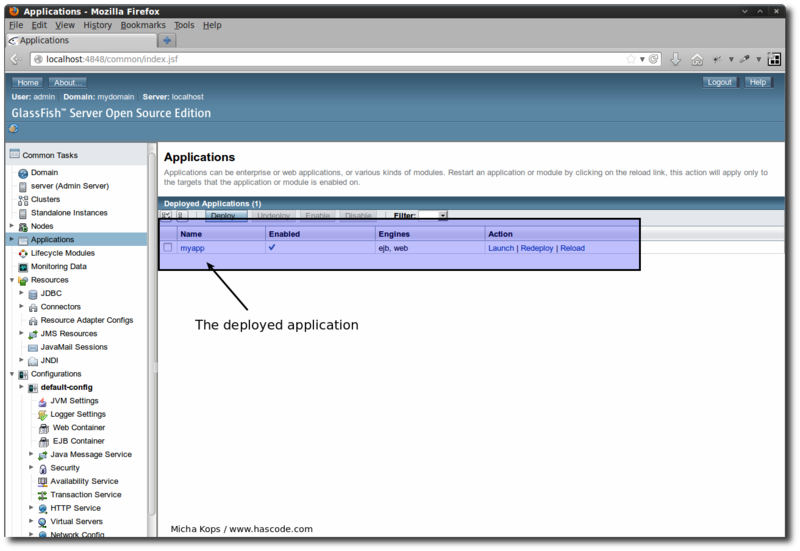 The application deployed on the GlassFish server. First of all, we’re creating a new Maven based job.. Creating a new maven 2/3 job on the integration server. In this section we may specify an interval to poll the repository for changes..
Set up the repository polling. We’re configuring Maven to run unit- and integration tests..
Now when we’re initiating the build by selecting “Build now” we should be able to watch Jenkins fetching the sources from the git repository and executing the test cases successfully. Test execution in job 1. Now we’re ready to create another job on our integration server to deploy the application when the first job running the tests finished successfully. We’re simply cloning our first job here and name our new build “my-jee-app-DEPLOYMENT” to reflect the purpose of this job. In the next step, we’re adding Maven goals to redeploy the application on the GlassFish server using cargo:redeploy. We’re skipping all tests here because they’ve already been run in job #1. Trigger job #2 using a post-build-action. We’re finished! When the first build is triggered and the tests do not fail, the second build is triggered and redeploys the application on the configured GlassFish instance. Dependant build triggered by post-build-action. There are many other alternatives – you could configure SSH credentials for a connection to the target server and simply upload the created web archive or enterprise archive to the autodeploy directory using SCP. This entry was posted on Wednesday, May 29th, 2013 at 7:45 pm	and is filed under Development, Enterprise, Java. You can follow any responses to this entry through the RSS 2.0 feed. You can skip to the end and leave a response. Pinging is currently not allowed. I was just wandering how to do that. Very good tutorial. Thank you. How to deploy to remote glassfish when we have access to this glassfish machine by ssh ?